Dozens of Israeli soldiers, including sharpshooters, heavily deployed across the border fence in the Gaza Strip, started taking positions and shooting posts in several parts of the besieged Gaza Strip, ahead of mass nonviolent protests in the coastal region. Update: The Palestinian Health Ministry said the soldiers shot three Palestinians with live fire; two in Abu Safiyya area, in northern Gaza, and one east of Gaza city. Israeli soldiers injure several Palestinians, including journalists in Gaza. Hundreds of Palestinians started heading towards the “Return Camp,” on their lands near the border fence, while dozens brought car tires to burn, and mirrors meant to deflect the soldiers’ aim. Meanwhile, the Palestinians started gathering on their lands, raising Palestinian flags, and chanting for liberation, independence and their legitimate Right of Return to all villages and towns which were destroyed and depopulated by the Israeli occupation forces in 1948. On its part, the Internal Security of the Palestinian Interior Ministry in Gaza issued various instructions to the Palestinians to remain committed to nonviolent protests despite Israel’s excessive use of force. It also advised the protesters to try to keep their faces hidden from Israeli surveillance, and to avoid the usage of smart phones, especially since the army infiltrated cellular networks last week to provide false information to the protesters. On Friday morning, Israeli navy ships opened fire on several fishing boats, in Palestinian territorial waters, in the northern part of the Gaza Strip, forcing them back to shore. On Thursday, the navy attacked fishing boats in northern Gaza, wounding three Palestinians, including one who suffered a serious injury. 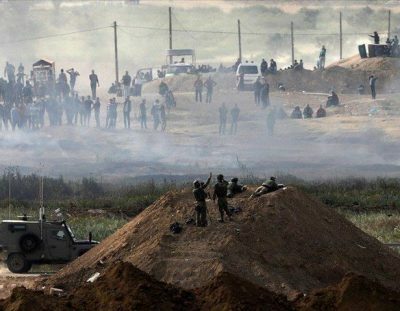 In related news, the Palestinian Health Ministry has reported that a young man, identified as Tha’er Mohammad Rabe’a, 30, died on Friday morning, from serious wounds he suffered when Israeli soldiers shot him with live fire, last Friday March 30th, in northern Gaza. his death brings the number of Palestinians who were killed by Israeli army fire since Friday, March 30th, to twenty-one, including the farmer, Wahid Nasrallah Abu Sammour, who was killed on his land early Friday morning before the Land Day protests began.